See more of what you love with the HUAWEI Mate 20 X, your ultimate entertainment companion this season - and every season! Dubai, United Arab Emirates —January 13th, 2019— Initially intended for few select markets globally, the Mate 20 X finally makes an unexpected appearance in the Middle East, exclusively on e-commerce UAE. The phone packs in all the revolutionary features from the Mate 20 series into a premium smartphone that is equipped with a larger screen, bigger battery and greater performance for a smartphone user experience that will blow your mind, from shopping to video streaming, this smartphone will not disappoint. With internet usage in the UAE being smartphone-centric, consumers are constantly demanding bigger, better smartphones that integrate world-class features and can satisfy their tremendous appetite for watching video content, gaming or even shopping. Huawei has the perfect answer to their demands - The HUAWEI Mate 20 X. The latest addition to the Mate 20 Series is the ideal device for users that desire an extraordinary viewing experience or an immersive gaming session. Whether catching up on the best Golden Globe Awards moments, getting fashion inspo from top bloggers, watching the ongoing AFC Asian Cup or playing an intensive round of PUBG to unwind, The HUAWEI Mate 20 X will bring you a front row experience to enjoy the show. Did we already mention a front row seat? HUAWEI Mate 20 X state-of-the-art 7.2 inch OLED screen designed for a truly immersive experience when following updates from your favorite influencers, fashion shows, blockbuster movies or the latest mobile games. The visionary screen also comes with an easy grip, as substance meets style with the precision-crafted HUAWEI Mate 20 X. Long gone are the days when you had to worry about your battery dying in the middle of your favorite show. Although HUAWEI Mate 20 X has a slim chassis, it houses an industry-leading 5,000mAh battery, a battery even larger than that of the astounding 4,200 mAh Mate 20 Pro battery. This phone delivers a staggering level of power that can handle intense gaming and long streaming hours while maintaining a low device temperature thanks to AI-resource allocation and “Supercool”, the world’s first liquid multi-dimensional cooling system. HUAWEI Mate 20 X inherits all the extraordinary camera set up and capabilities of the HUAWEI Mate 20 Pro, such as the Ultra Wide Angle Leica Triple Camera that ensures nobody gets cropped out. This game-changer will enable you to take uncropped, uninterrupted photos in one shot and capture those Instagram-perfect moments that you will remember forever. While the camera’s Macro photography lens captures even the smallest details with its extreme close-up shots, turning your pictures into professional photographs. And if that wasn’t enough, whether you’re watching a movie, listening to the latest 2019 hits or playing a mobile game, Mate 20 X’s stereophonic sound system that transports you inside your movies, music and games. With dual symmetrical speakers at both ends of the device, plus a super high dynamic range up to 40 db , every sound from bass to treble is rendered with astounding clarity, richness and depth for a fully immersive audio experience. The HUAWEI Mate 20 X 6GB RAM + 128GB ROM is available in Midnight Blue at a price of 2499AED (inclusive VAT). 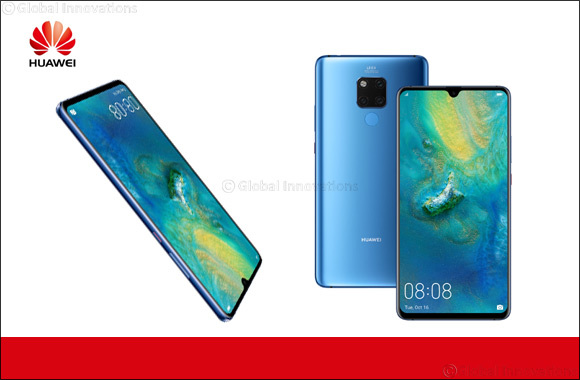 Launching in the Middle East exclusively in the e-commerce UAE, consumers will be able to pre-order HUAWEI Mate 20 X starting January 11th, and purchase the HUAWEI Mate 20 X online from starting from January 15th at https://shop.huawei.com/ae-en/buy/mate20-x. HUAWEI Mate 20 X Care comes with standard Huawei VIP service offer that includes a 6 months single-time free screen damage warranty, free UV device sanitizing, free customized engraving and door-to-door service. The VIP service is eligible for all Mate 20 X purchased before 31st January, 2019.